Sometimes it’s much easier to use an over the shoulder pet carrier than a traditional one. You may have a hard time with regular pet crates because your dog or cat has arthritis, or find that the handles hurt your hands. When you use a shoulder bag, it not only makes it easier on your hands, but your pet may also find it more comforting. There are many types of shoulder carriers. There are backpacks, and some have wheels. You can also get pet slings, much like what you would put a baby in, but made specifically for dogs and cats. Pet tote bags are also nice, and there are regular carriers that have adjustable shoulder straps as well as handles. People with small pets like to use slings to keep them safe after surgeries or broken bones. 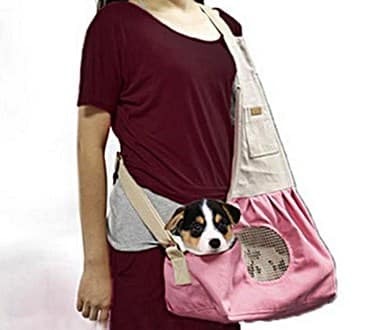 Also, when your pet is just a puppy or kitten, a pet sling will allow you to take them around the house, at the same time keeping your hands free to do other things. 1 Which Over the Shoulder Pet Carrier is the Best? Which Over the Shoulder Pet Carrier is the Best? Everyone has their own preferences, which is why we are suggesting a few different types of carriers that go over the shoulder. Each has its pros and cons, for both pets and their owners alike. We have listed different types of shoulder carriers below. By knowing what to look for, you can make the best decision for yourself and your pet before buying. Let’s take a closer look at the options. If your pet has just had surgery, the vet will tell you that you should keep them in a carrier or a crate. Some animals may get upset when they are alone, so using a carrier with a shoulder strap will allow you to keep them close to you, easing their anxiety. One of the best pet carrier shoulder bags is the Sherpa Original Deluxe Pet Carrier. You can click the link to read our full review. This carrier does have handles, but it also has a padded shoulder strap. When taking trips to the vet or traveling, you will find that this carrier will meet all your needs. There are side pockets which allow you to carry additional things with you without the need for another bag. If you’re looking for a soft-sided traditional style carrier, this is one of the few that has a shoulder strap. Although it may seem strange, backpacks are a great way to carry your pet. They allow you to have your hands free and go over both shoulders. If you are prone to muscle strain, especially in your back, this may be a perfect choice. A good pet backpack is the Pet Gear I-GO2 Traveler Roller Backpack. 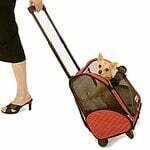 If you are traveling, this pet carrier backpack is approved by many airlines. It also has tethers for a seat belt while in the car. Backpacks have sturdy bottoms, like traditional pet carriers. If you have a small pet with a laid-back personality, you can take them with you when running errands without getting noticed. Tote bag pet carriers look very much like regular tote bags. One of the best is the Sherpa Tote Around Town Pet Carrier. It is dark, and unless someone is looking very hard, they won’t be able to see your pet. If you want to use a pet tote bag, your dog or cat must be small. The suggested weight limit is under 15 pounds. This would not be the best choice if your pet is fidgety, or whines or barks when it sees other people. Pet slings are a great option when you have a puppy or kitten and don’t want them to run loose in the house when you are busy. Since they tend to get into things that they shouldn’t, it is a good way to keep them safe. For small pets, slings make them more comfortable, as they provide a warm and cozy bed that surrounds them. They are good for anxious pets who want to be at your side constantly. They provide stability and comfort. The Outward Hound Kyjen PoochPouch Sling is a good choice especially for older pets when they can’t get around very well anymore. There are two safety features in this sling. One is an attachment that you can use on a harness, and the other is a strap that keeps the sling snug around your pet, giving them comfort as well as safety, as to not fall or jump out. The 4 Lazy Legs Adjustable pet sling is another quality sling. It also allows you to keep your pet close to you and has a drawstring for making it snug. This one has a weight limit of up to 30 pounds. It also has an adjustable and padded shoulder strap, making it more comfortable for you. Carrying your pet with you makes them feel more secure. These are especially good for smaller pets that have separation issues or have had a recent surgery or a broken bone. It will allow them to go around the house with you like they are used to doing, without the chance of them getting hurt. Shoulder carriers allow you to have your hands free to do other things. It’s almost impossible to do most things while carrying your pet in your arms. If you have arthritis in your hands, one of the above types of carriers will make it easier for you to take your small pet with you, especially to the vet or when traveling. Some of these carriers also have extra pockets, much like those without straps, so that you will be able to take other necessities along with you such as keys, cell phones, wallets, and other things that your dog or cat may need while they’re out of the house. As the weight is not pulling your arm down, you will be able to use the carrier for a long time without cramping or pain in one arm or the other. A backpack will also ease the tension in your shoulders, supporting the weight of your pet in the middle of your back. Make sure that you measure your pet before buying a carrier. Putting a harness on your cat or dog is best when using the safety clips that are on the shoulder carriers. The reason for this is because if they decide that they want to try to get out, the strap will stop their whole body instead of just catching them by the neck. Never go over the suggested weight. The bottom will not be able to support them and can cause the carrier to collapse under your pet. Any pet carrier or crate is the best way to keep your pet safe. Just be sure to take the proper measures for the utmost safety and comfort for both your pet and yourself. The last thing you want is for your pet to feel uncomfortable and not safe, or for you to feel uncomfortable in carrying it. A shoulder strap that has padding will be more comfortable for you, and the best over the shoulder pet carrier will allow you to stay close to your pet, whether it be young or old, or have problems getting around.